The world’s premier intelligence agency just lost another batch of text messages! 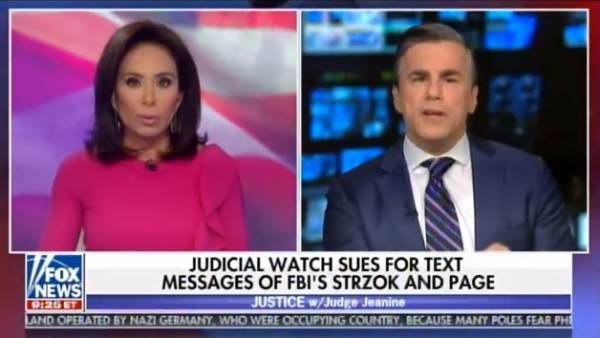 Judicial Watch president Tom Fitton joined Judge Jeanine Pirro on her FOX News program Saturday night. Tom Fitton told Judge Jeanine how difficult it was dealing with the Jeff Sessions Justice Department. The FBI will not turn over Deputy Director Andrew McCabe‘s text messages! Andrew McCabe was famously mentioned in a Peter Strzok – Lisa Page text message discussing an “insurance policy” against a Donald Trump presidency. The FBI told Judicial Watch they can’t find McCabe’s text messages! Tom Fitton: We sued back in September for the text messages of the number two at the FBI, Andrew McCabe. And they just told us this week, they gave us everything they’re going to give us, and not one text message was turned over. They lost all of Andrew McCabe’s text messages! I don’t believe it. There’s still gamesmanship going on. Less than a week later Andrew McCabe was “removed” from his post at the FBI. This comes the day after Director Wray visited Capitol Hill to view the secret House Intelligence Committee FISA memo. It was a sudden “removal” of Wray from the FBI. And the FBI is hiding his text messages from a watchdog group! This story looks worse and worse for the Deep State FBI.